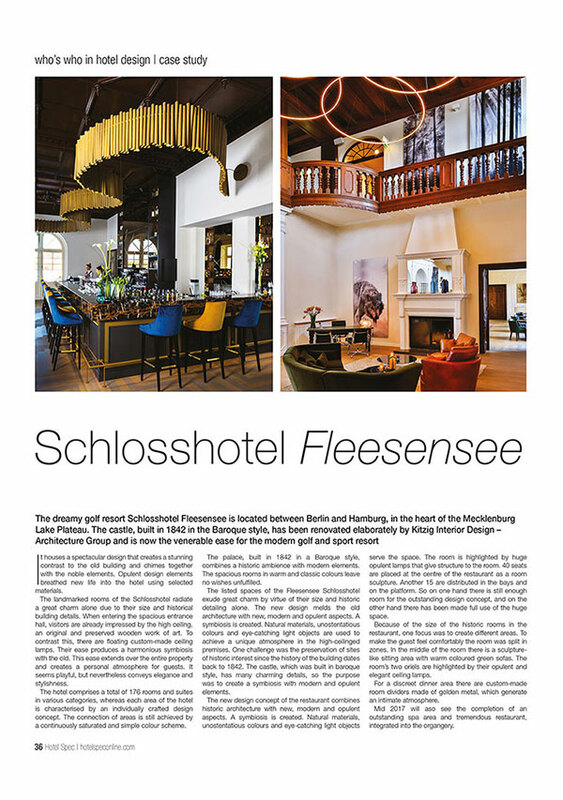 The dreamy golf resort Schlosshotel Fleesensee is located between Berlin and Hamburg, in the heart of the Mecklenburg Lake Plateau. The castle, built in 1842 in the Baroque style, has been renovated elaborately by Kitzig Interior Design – Architecture Group and is now the venerable ease for the modern golf and sport resort. It houses a spectacular design that creates a stunning contrast to the old building and chimes together with the noble elements. Opulent design elements breathed new life into the hotel using selected materials. The landmarked rooms of the Schlosshotel radiate a great charm alone due to their size and historical building details. When entering the spacious entrance hall, visitors are already impressed by the high ceiling, an original and preserved wooden work of art. To contrast this, there are floating custom-made ceiling lamps. Their ease produces a harmonious symbiosis with the old. This ease extends over the entire property and creates a personal atmosphere for guests. It seems playful, but nevertheless conveys elegance and stylishness. 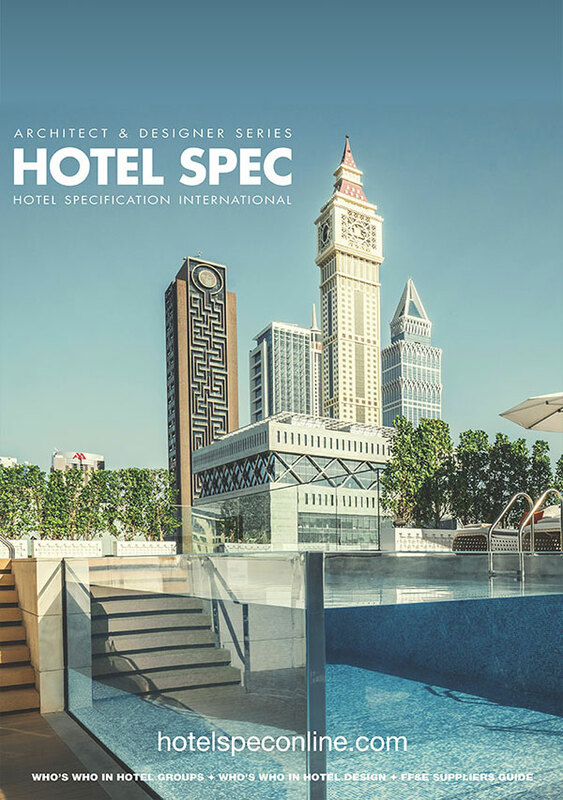 The hotel comprises a total of 176 rooms and suites in various categories, whereas each area of the hotel is characterised by an individually crafted design concept. The connection of areas is still achieved by a continuously saturated and simple colour scheme. The palace, built in 1842 in a Baroque style, combines a historic ambience with modern elements. The spacious rooms in warm and classic colours leave no wishes unfulfilled. The listed spaces of the Fleesensee Schlosshotel exude great charm by virtue of their size and historic detailing alone. The new design melds the old architecture with new, modern and opulent aspects. A symbiosis is created. Natural materials, unostentatious colours and eye-catching light objects are used to achieve a unique atmosphere in the high-ceilinged premises. One challenge was the preservation of sites of historic interest since the history of the building dates back to 1842. The castle, which was built in baroque style, has many charming details, so the purpose was to create a symbiosis with modern and opulent elements. The new design concept of the restaurant combines historic architecture with new, modern and opulent aspects. A symbiosis is created. Natural materials, unostentatious colours and eye-catching light objects serve the space. The room is highlighted by huge opulent lamps that give structure to the room. 40 seats are placed at the centre of the restaurant as a room sculpture. Another 15 are distributed in the bays and on the platform. So on one hand there is still enough room for the outstanding design concept, and on the other hand there has been made full use of the huge space. Because of the size of the historic rooms in the restaurant, one focus was to create different areas. To make the guest feel comfortably the room was split in zones. In the middle of the room there is a sculpturelike sitting area with warm coloured green sofas. The room’s two oriels are highlighted by their opulent and elegant ceiling lamps. For a discreet dinner area there are custom-made room dividers made of golden metal, which generate an intimate atmosphere. Mid 2017 will aso see the completion of an outstanding spa area and tremendous restaurant, integrated into the organgery.